Start the new year in this amazing, private, custom-built home on 2 acres in the exclusive, gated community of High Grove! 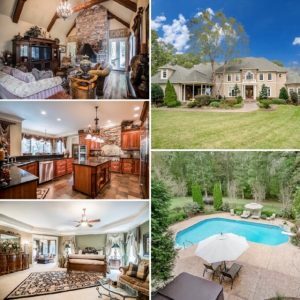 So many luxuries: Travertine floors, in-ground pool, custom wood work, dramatic formal rooms, lots of built-ins, security system, garden tub, Surround Sound, gleaming hardwoods, floor-to-ceiling stone fireplace in family room (one of 4 total! ), heavy moldings and archways, vaulted great room and more … This 10,861-square-foot home includes 1st-floor master suite with fireplace and sitting room, sunroom, office, 1st– and 2nd-floor laundry rooms, bonus room, plus fully-finished basement with guest suite, gym, game room and kitchen! The gourmet kitchen has stainless-steel appliances, extra-wide refrigerator, wine rack, double oven and island with seating. Outdoors you’ll love the screened porch with slate floor plus an enormous deck, both overlooking the pool and fenced yard. Lush landscaping and no neighbors on either side complete this hidden gem. The home is located near Concord Mills Mall and I-85! !